If you are looking for eco-friendly International art in the Riviera Nayarit and Puerto Vallarta Mexico area, don't miss the Grand Opening of Splurge Art Gallery in Bucerias on November 5th, during the first Bucerias Art Walk of the 2009 Season. Kevin Jenne, a renowned Canadian artist, is at the centre of the gallery's vernissage. Kevin uses paints from Tri-Art, a company that recycles all its water: nothing goes to waste at Tri-Art, a truly socially responsible company. 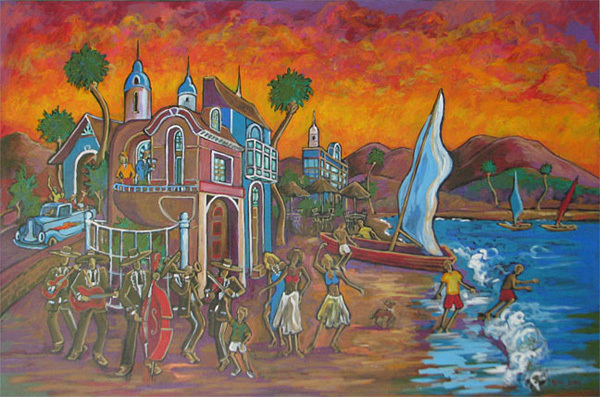 Kevin's piece, "Bucerias", showing the brilliance of Mexican colours and the spirit of its people, will be on display for the first time in North America. Carolina Echeverria, a Chilean artist, works on TerraSkin rock paper, "Cradle to Cradle" certified. It uses no trees, water or toxic chemicals. Her eco-friendly work opens at Splurge, the first gallery to have paintings done on TerraSkin. Splurge is committed to bringing international art and artists to the Bucerias community, as we support eco friendly artists and companies. They will also be showcasing designer pewter. On November 5, 2009 from 7 to 10 pm (Jalisco time), Splurge Gallery, located at Lazaro Cardenas 62b in Bucerias, will be celebrating their grand opening with a reception offering The Splurge – 1 part Tequila, 2 parts Champagne, and a splash of Guayaba juice, door prizes and gifts for accredited press.